The best way to plan and order your balloon decorations is to come into our shop in Oswestry Indoor Market. We can help you plan your event and give you advice as to what might look great in your venue. Your order will be prepared and it will be ready to pick up when you arrive. Balloons can come in all shapes, sizes and colours, and you won't be spoiled for choice! If you're not sure what possibilities exist - or would appreciate talking to someone, then drop into our store in the Oswestry Indoor Market to see what's possible or get advice. 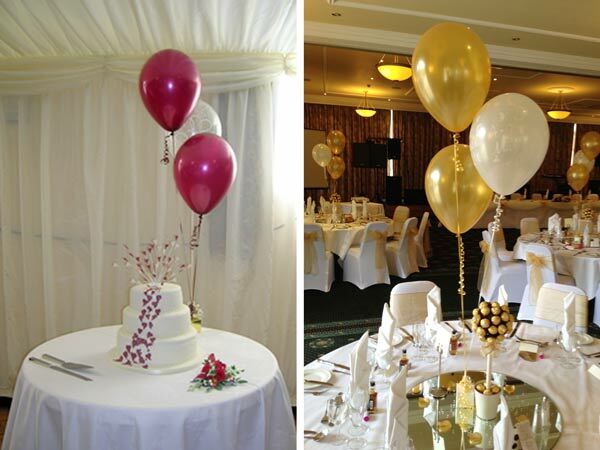 There are many designs and colours of decorations that may suit your event. LOOKING FOR IDEAS? SEE OUR GALLERY TO GET INSPIRED! For your convenience we accept most major credit and debit cards. You may either collect yourself from our store or, for a delivery charge (amount dependent on the location), on the day of your event we can also come to the venue to deliver and arrange the balloon decorations for you - all part of the service!